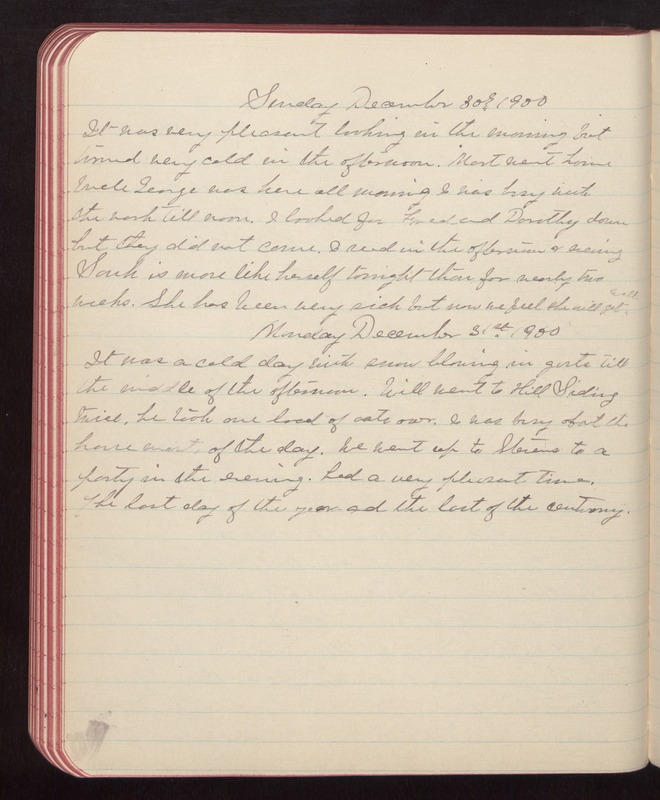 Sunday December 30th 1900 It was very pleasant looking in the morning but turned very cold in the afternoon. Mort went home Uncle George was here all morning I was busy with the work till noon. I looked for Fred and Dorothy down but they did not come. I read in the afternoon & evening Sarah is more like herself tonight than for nearly two weeks. She has been very sick but now we feel she will get well. Monday December 31st 1900 It was a cold day with snow blowing in gusts till the middle of the afternoon. Will went to Hill Siding twice, he took one load of oats over. I was busy about the house most of the day. We went up to Stevens to a party in the evening. had a very pleasant time. The last day of the year and the last of the century.